What Model of Slow Cooker is Right For You? Home » Crock-Pot » What Model of Slow Cooker is Right For You? Choosing the right slow cooker means all of the difference if you will love or hate your slow cooker. Here is a guide to help you make your best decision in purchasing a slow cooker. There are many great reasons to use a slow cooker. Some of my favorite reasons to use a slow cooker is you can make a good meal without having to stand over the stove. Slow cookers are economical to purchase, and to operate. You can cook soups, stews, and roasts during the summer without heating up your kitchen. You can make many economical meals in your slow cooker. Hands down my favorite reason for using a slow cooker is that you can set and forget your meal. Many of our favorites can take a long time to prepare. I love roast, and you can put this in a slow cooker early in the morning and come back later in the day, and you have a perfectly cooked roast. Soups and stews can cook at low temperatures without the hassle of managing the whole process. You can find slow cookers available at a large variety of price points. Entry models will do the job, but they may not have programming that more sophisticated models have. Some can cook foods at a certain cooking temperature, and if you don’t turn the unit off, it will reduce the temperature to warm. The variable temperatures are great if you are running errands and get home a little later than you anticipated. I live in the South, and to say it is hot in the summer is an understatement. I love slow cooking meals, but during the summer, I am going to reach for my slow cooker, and skip the stove. The stove can heat up my kitchen, but the energy efficient Crock Pot does not heat up the whole kitchen. They also take less energy to operate than an electric stove. So if you are trying to save on your electric bill, this remains a smart choice. Slow cookers are for simmering. If you want to fry, bake, boil or grill, the slow cooker won’t work for you. It keeps your soups and stews warm for hours after cooking, and most of them have timers that will let you know when the food is done and how long it’s been simmering. It’s practically impossible to cook your food incorrectly when you use a good crock pot. Got a love for small kitchen appliances? Look no further than the slow cooker. If you adore all the extra additions for the kitchen, you have to get a slow cooker! Also known as the “crock pot”, slow cookers have been around since the early 1970s. You can find people with slow cookers in their home in the United States, New Zealand, and Australia. Slow cookers sit on your kitchen countertop, taking up about the same amount of space (depending on the size) of a can-opener or a microwave. It’s used to simmer food for a length of time, allowing it to cook slowly. It also lets you go do other stuff while the smell of the delicious food you are cooking fills your home. One of the basic features of many nicer slow cookers is a timer. They will signal when your food is done. This is helpful, so you know exactly how much longer your food needs to cook before it is ready. Some timers may adjust the temperature when the cooking process is done. This way your food won’t get over-cooked. If you are looking for a basic slow cooker, this may be a feature you want to skip. It was a real pain back in the seventies to get your crock pot clean. You couldn’t submerge it in water, so you always took a chance that residue was left behind. Well, that’s no more. Today, even the small cookers have inserts or are waterproof if there is no insert. Most of the inserts are dishwasher safe so clean up is very easy. If I am taking my Crock Pot to a party or pot luck I will sometimes buy the liners, so I can toss the liner at the party, and then I can take home one that isn’t dirty. Some slow cookers come with one or two inserts. One is very large and has one section. The second insert is split down the middle, allowing for two delicious foods to be made at the same time. If you plan to make a stew, and a dip take to an occasion, such as a Christmas party, a Bar Mitzvah, or a graduation party, this slow cooker could be just right for you! One of the considerations you will be deciding upon is how many people you want to serve. You are going to be looking at a lot of options, so before you make a choice, make a list help you decide. Are you buying the slow cooker to make meals for a large family or the possibility of upcoming parties? If you are a football fan, Superbowl season is the perfect time to own a slow cooker so you can make some of the best cheese or chili or chili and cheese dips and share them with your friends. 4 quart – many recipes are written for 4 quart slow cookers. This would be a good option to get for your first slow cooker. 5 quart – this is the largest of the standard sized slow cookers. This is enough for a small family and medium sized families. is a great option to take to work and to skip the lines at the microwave. I also use this one to bring to parties. I bring cheese dip in here or sometimes I bring Hot French Onion Dip in mine. , it is a tiny serving pot, the smallest of its kind, perfect for just one person, keeping your lunch warm at work or for making cheese dips for yourself. These often come in round or oval shapes. You can find some rectangular shapes. Round shapes are good for soups and stews. Oval and rectangular shaped pots are better for roasts and bread making. According to Kathy Hester of http://healthyslowcooking.com/ says round models can have hot spots, and this makes them poor choices for bread making. I think you can get my mileage out of oval slow cookers because you can put roasts, whole chickens, and other goodies in them with great ease.
. Did I mention I love this?? While these aren’t so useful for making chilis, stews, or much of anything else that requires serious cooking. These are excellent for heating up lunch at work, serving hot dips at parties, and is good to hold gravy for a holiday party. These have their place but aren’t essential. I think these are good starter, models. Personally I would suggest the oval over round unless you intend to make only soups and stews. – This is a great choice because it has interchangeable pots, this one can serve as a 2, 4, or 6 quart model. So this one can act as a large or a small cooker. – I love this model because it has a locking lid. This is great for traveling. You can lock down the lid and feel comfortable the lid will stay shut while you travel. – 6 ½ quarts, perfect for a family of six. It has a programmable timer that goes up to 24 hours. You can set it, go to work and come home to a delicious dinner and a house filled with a wonderful aroma. As with all good quality cookers, when the timer for cooking is done, it shuts down the cooking side and starts the “keep warm” process. Your food won’t overcook and it won’t get cold! Some of the most delicious looking recipes you’ve ever seen can be spotted on the cover and in the pages of a slow cooker recipe book. There are more scrumptious soups, pot roast, snacks, boiled dinners and stews made in slow cookers than you can probably imagine. And when it comes to slow cookers, you can have your pick. World famous companies have manufactured and offered meals developed specifically for crock pot cooking. One of the most popular would be pot roast. Who doesn’t love a delicious pot roast with potatoes, onions and delightful spices? You can make up your own recipes when it comes to meals like this. 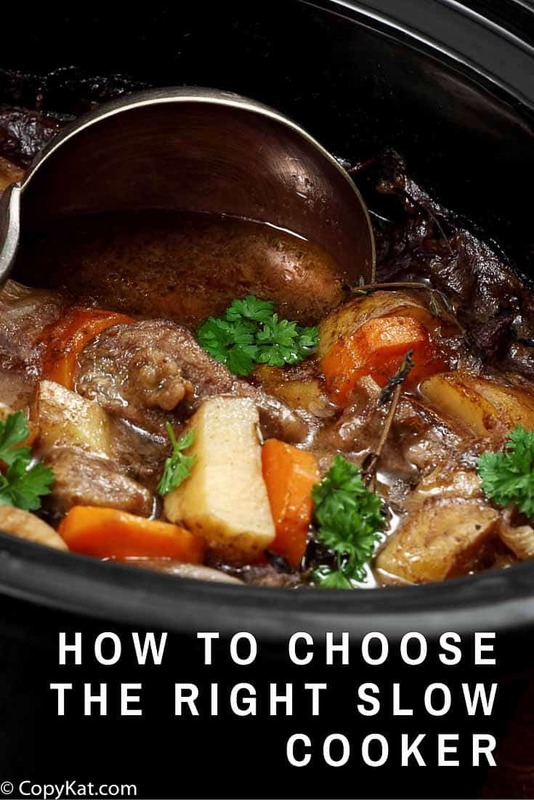 Since stews and soups are popular meals made in crock pots, you have two options – you can create your own recipe, adding only the items you like the most or you can buy one, of the many crock pot recipe books available on the market today. Always read the instruction manual and make sure following directions and you are not putting in too much food. Overloading a cooker will not only put a strain on it, it will not cook the food correctly. Then you might be under the impression there is a problem with the cooker when it was actually a user issue. Make sure any meat you are using is completely thawed before you place it in the cooker. If you have cut your vegetables and meat up before you plan to cook them, refrigerate them until they go into the cooker. If you have an insert, warm it at the same time as the slow cooker. They should heat up at the same time. Make sure you are putting the correct amount of liquid in the cooker. Don’t use your cooker as a re-warmer. Food that has already been cooked will not reheat correctly in a slow cooker. Use a microwave or regular stove and use the cooker only to serve and transport. If you have leftovers, let the food cool before putting it in a refrigerator for storage or transfer the food to a proper storage container. The shock of a sudden temperature change can cause the pot to crack. If you lose power while the cooker has food in it, you can finish cooking it on a grill or camping stove. If you aren’t home or don’t have a grill to cook it on, it’s best to throw it away. All crock pots are excellent small kitchen appliances. However, some are of the opinion that oval cookers do a more even cooking job. This is something you will want to determine for yourself, depending on what you are cooking in your pot. Also, watch for any “hot spots” your pot may have. This is something that can change from one appliance to another. I hope this guide helps you choose the best slow cooker that will fit your needs. I think it is important to consider size, features that you desire, and what you are going to cook in your slow cooker. What is your favorite type of slow cooker?